in Sydney, Melbourne and Brisbane, Australia and in Wellington, New Zealand. Every one of these events met with overwhelming success. of 9/11 Studies who also manages Scienceof911.com.au. A panel assembled Saturday afternoon also included the participation of James O’Neill, practicing barrister in Queensland, who offered commentary on potential legal proceedings and Dr. David Leifer, Doctor of Architecture and Associated Engineer, Senior Lecturer at Sydney University. which we hope will lead to inroads into the faculty and administration there. us separated, and stand firmly, united with a common message of peace and justice. efforts remain extremely valuable and effective. While all our investigative compiling of information and our internet activism that makes it widely accessible is of course integral to our efforts, there is simply no substitute for dialogue, one human being with another. In fact, John Bursill reminded me the Sydney group was the first international group to become active with the Eleventh Day of Every Month Until Justice campaign. They continue to carry out these actions each month, which have also spread to Perth, Brisbane, Melbourne, Wellington and Christchurch. John was quite inspired by the quote from Dan Wallace, whose father was killed on 9/11 and was one of the first activists in New York : “They took it from the top to the bottom. 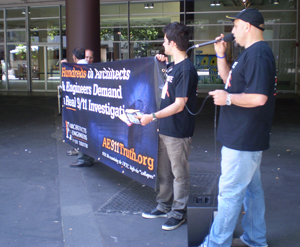 We’re going to take it from the bottom to the top.” This Down Under Tour is further fulfilling Dan’s hope, carrying the movement back up from the “bottom” of the globe back up to reinvigorate energy within the U.S.
was sent home with a copy of AE911Truth.org’s DVD, “9/11: Blueprint for Truth”. more at the 911oz forum and a bit of video at WeAreChange.org. A good review of the Wellington event, by Claire Swinney, has been posted here. John Bursill is known to often remind us, “Truth is not an idea for people of worth; it’s a standard.” This tour has truly reflected John’s own high truth standard, and that of the many other ‘persons of worth’ who worked alongside him to help bring this about. 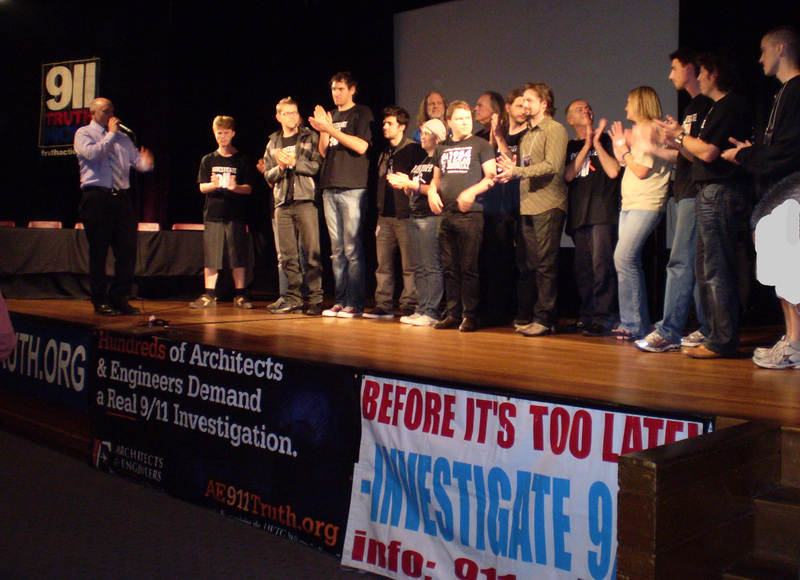 It reflects well upon us all, and I once again find myself thoroughly impressed with and extremely proud of the passion, dedication, compassion and commitment exhibited by my fellow 9/11 truth advocates around the world. Toward the day when we see that light, indeed, prevails over might!